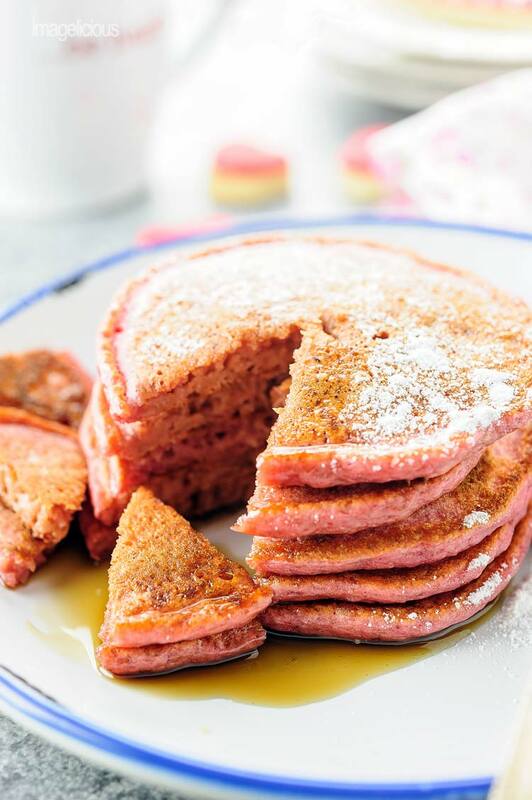 These beautiful pink Cinnamon Beet Pancakes are full of healthy beets and greek yogurt, yet you’ll never know as they taste delicious. Perfect for a Valentine’s Day breakfast or to make any breakfast special. We stopped doing anything special for Valentine’s Day. It seems like a forced holiday. Restaurants are all booked, the food is mediocre, service is rushed. All the cheesy pink and red hearts are floating around for no specific reason. Yet, I still like the day. I always hope for some gesture, a token. Maybe a rose stem or a piece of toast cut in a heart shape. When my husband and I just started dating I went all out for our first Valentine’s day together. There was a romantic multi-course dinner, heart shaped cookies, pinks, and reds, and sticky sweets. Too much, too girly, too frilly, but it was actually genuine and from the heart. For our second Valentine’s day we were already engaged and went to a nice restaurant. I don’t remember the food. I remember that there was not enough of it. One oyster as an appetizer. Single raviolo for the pasta course. We went home laughing and then ate deli sandwiches in the kitchen. Later, when we got married we still tried to have a proper (what’s proper?) Valentine’s day dinner in our suburbs, it didn’t go well. No reservations, long lines, we ended up at some mediocre middle eastern place and we still remember that meal in all its absurdity. It seems like the cupid arrows weren’t aiming at us the year after either. I remember waking up to the delicious smell of smuggled bacon. I still have no idea how A. got the bacon into the house and into the fridge without me noticing it. I came downstairs to the crisp bacon and the heart shaped toast and a headache and a full blown cold. He went to work only to come home in the middle of the day also sick. We stopped even trying to do anything special on V-day. There are no pinks or reds or hearts or sweets. There are just our normal dinners. If I lived alone I don’t think I’d cook. Eggs and sandwiches are just too easy and more convenient. I always cook for someone. And those normal, regular, everyday dinners and breakfast and lunches and snacks they become special in their own way. Because I make food for someone I love. And so this Valentine’s day dinner there will most likely be no special meal, no special cutlery, no candles, but there will be food. Made with care, made with, yes, I know, it sounds cheesy, love. 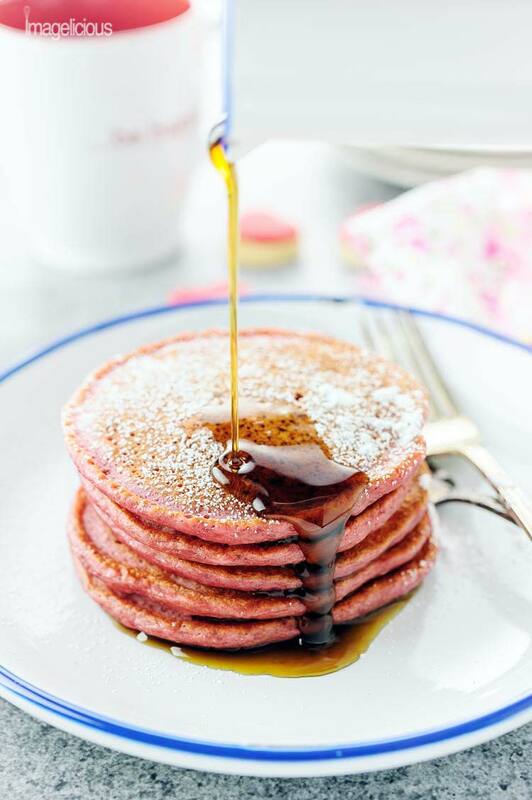 And maybe, just maybe I’ll wake up in a romantic mood and then I’ll make these pink Cinnamon Beet Pancakes. Lightly spiced and doused in maple syrup. I bought cooked beets recently at Costco. So, I have lots of them in my fridge and I’ve been making different recipes with this humble and under-used root vegetable. Beets are in my Russian blood, but I usually eat them in only a handful ways – borscht and a couple of different Russian beet salads. A., unfortunately, doesn’t like beets, so I try to hide them. They have such a distinct colour, that I can’t really fool him, but I can hide the taste. I was trying to come up with a way to use beets and then it hit me. 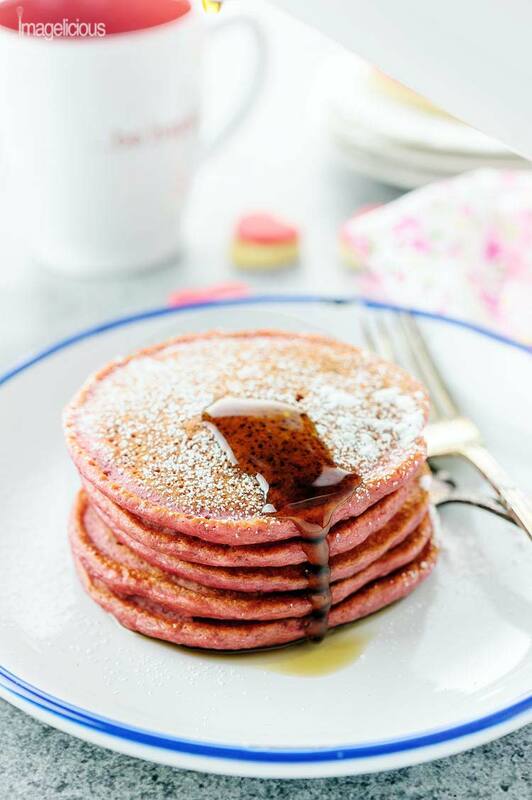 If I can use pumpkin puree to make pancakes, then why can’t I use beet puree to make Cinnamon Beet Pancakes? I processed the beets in my mini food-processor until very smooth, then made a pancake batter with it. Beets have a pretty distinct taste and I knew I had to mask it somehow, so I added some cinnamon and a pinch of cloves. Not enough to make the pancakes seem too christmassy, but enough to add a distinct flavour and to hide the taste of beets. I purposefully made the batter on the thinner side, I wanted the pancakes to be more delicate and less bready. A. wasn’t convinced and was worried until he took the first bite. And then the second, and then he got himself another helping. 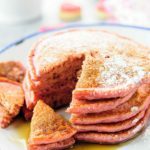 Yes, if the Cinnamon Beet Pancakes are eaten on their own, there’s a very slight hint of beets, but with a sprinkling of icing sugar and a drizzle of maple syrup, the pancakes taste light and sweet and spongy and delicious. Oh, and don’t they look absolutely adorable? Perfect for Valentine’s day, Mother’s day, Birthday, or just to celebrate weekends and your loved ones. 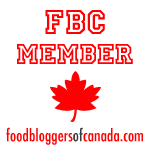 For another awesome pancake recipe, try my Carrot Cake Pancakes with Cream Cheese-Maple Syrup. Puree the beets in a food processor until very smooth. In a large bowl whisk together the beet puree, greek yogurt, and milk. Add the cinnamon, cloves, and sugar. Whisk well. Add the flour and baking powder and mix with a spatula until the flour disappears but the batter is still lumpy. Batter will be on the thinner side. If you feel that it’s too thin, add another 1/4 cup of flour. Let stand for half an hour to an hour. Heat the pan on medium and brush oil on it. Once the oil is hot, pour generous tablespoons of batter on the pan and fry the pancakes for about 3 minutes until bubbles start to appear on top. Since the batter is pretty thin, it’ll spread, so leave enough space between the pancakes and don’t over crowd the pan. Once the bubbles appear and the top gets matt in colour, flip and cook for another 3-4 minutes. Keep the pancakes in a 200F oven while cooking the other batch. 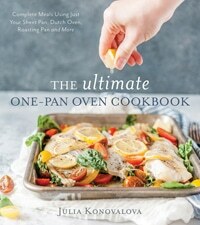 Julia, I just love the colour and the idea of sneaking beets into innocuous things like pancakes. And your Valentine’s Day escapades sound so much like mine! Haha, here’s to a year of resisting commercial messaging about how to celebrate love. Ksenia – I am glad I am not the only one with VDay misadventures 🙂 I hope you have a wonderful day filled with love that is not just special for that day but is present every other day of the year! Thanks Amanda – my battery on the remote control was dying, so I am glad I was able to get one action shot. 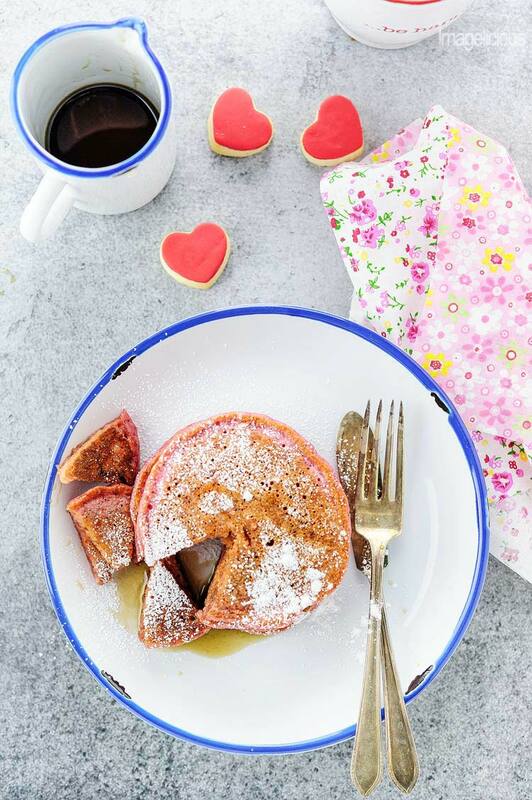 How beetiful are these pancakes (pun intended :P)! Screw valentines day dinner, I’d much rather have these for valentines day breakfast! I love that they are healithified and made with greek yogurt! Hi Lily – I did not expect how cute they’d turn out. And they taste yummy too. I hope you try them. These are seriously so pretty and creative! We always have beet puree in the freezer (my kids favourite cake is a chocolate beet). I can’t wait to make these for my little ones. Thanks! 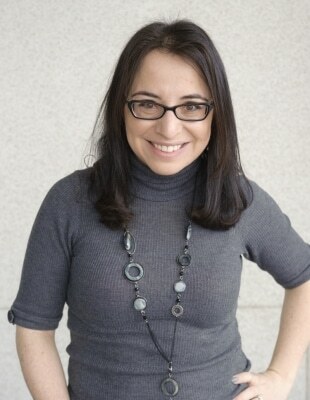 Thanks, Aimée! I didn’t know beet puree could be frozen. Does it get watery a bit after being defrosted?